Texas Online Radio: Sacred White Buffalo born in Greenville, Texas. Ceremonies slated for June 29. 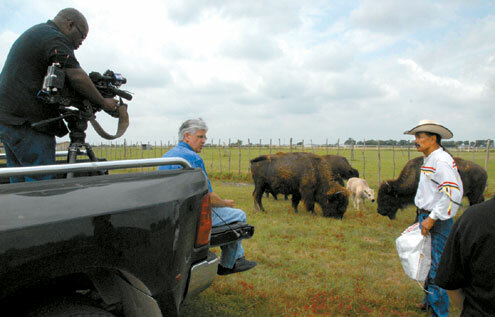 Sacred White Buffalo born in Greenville, Texas. Ceremonies slated for June 29. A rare, white, non-albino, male buffalo calf born on a Greenville, Texas ranch and considered sacred by Native Americans will be named and dedicated in ceremonies slated for June 29. The public dedication portion of the event will begin promptly at 9:00 a.m. at the Lakota Buffalo Ranch at 2888 Highway 380 in Greenville Texas, and will include gourd dancing, traditional drum ceremonies, and Native American arts and craft vendors, as well as food vendors. Greenville is approximately 45 miles east of Dallas on Interstate 30, or 30 miles west of McKinney on US Hwy. 380. 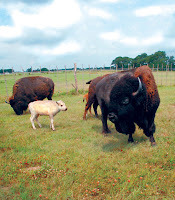 Arby Little Soldier, great-great-great grandson of Sitting Bull, said that the birth of a white buffalo is a one-in-ten-million occurrence and fills a prophecy that has lived in the hearts of many Native Americans for centuries. The calf will be named Lightning Medicine Cloud in recognition of the circumstances of his arrival, and is highly guarded by both the War Chiefs stationed at the ranch and the buffalo themselves. Buffalo are aggressive animals, and have demonstrated unusual protective behavior toward this calf, circling around him when anyone, even Arby Little Soldier, comes near. ...read the full story here. Arby Little Soldier (right) is interviewed by a Dallas TV crew. The white buffalo has long been sacred to the Lakota as well as other Plains tribes, such as the Kiowa, Apache, Cheyenne, Hidatsa, and Pawnee. They believe that man's survival as a people depends on heeding the white buffalo's sacred message, which urges man to live with the understanding that all living beings are linked and interdependent. The white buffalo is considered a warning by the Lakota, but it is also a chance for all people to collectively focus their energy on the peaceful, healthy, harmonious world that the buffalo is urging us to create. For more information on the event visit www.lightningmedicinecloud.com or call the Greenville Chamber of Commerce at 903-455-1510. The Chamber website at www.greenvillechamber.com has links to area lodging. 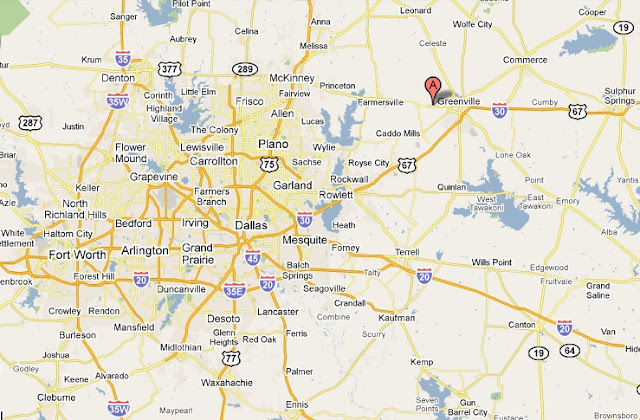 The Greenville Chamber is also partnering with the McKinney Convention and Visitors Bureau, www.visitmckinney.com, and with the Texas Lakes Trail Region, www.texaslakestrail.com, on this event.